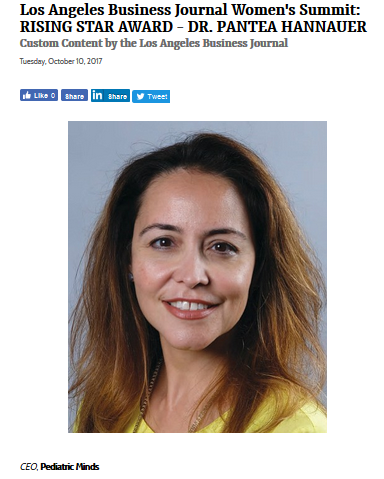 Our Medical Director and Founder, Pantea Sharifi-Hannauer, MD, was awarded the Rising Star recognition through the Los Angeles Business Journal (Women’s Summit, 2017) for creating a unique and effective program here at Pediatric Minds Medical Center, The Early Childhood Treatment Center. This award is given to women who have made significant achievements and contributions to their industries and the LA community. Our Medical Director was honored to receive this award and to know that Pediatric Minds is cutting edge in how its making a difference in and contributing to the lives of many people in our LA community. Dr. Sharifi-Hannauer was also recognized and honor as one of Los Angeles’ Top 10 Pediatrics Specialists by The Caster E-Newsletter (Vol 16, Issue 2, page 1, 2017). She was nominated by her patients and other Physician colleagues for all the hard work and incredible care that she provides. Her dedication and passion to helping children with special needs not only is evidenced by the clinical care she provides, but also by the strength and perseverance she demonstrates in trying to work with challenging health insurance providers to get special needs children the services that they need. Well done Dr. H! 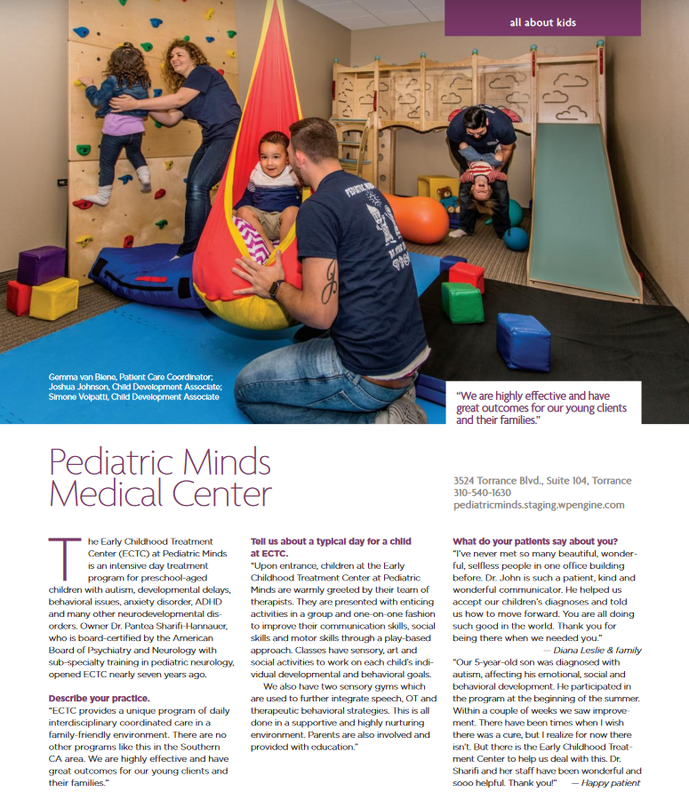 The Early Childhood Treatment Center at PMMC has also been recognized locally through South Bay Magazine (Moon Tide Media), for all its achievements and accomplishments in helping our special needs children in the South Bay. Our staff and special needs families have worked very hard in helping our special needs children improve and achieve their full potentials.